In a saucepan, heat the oil and add the onion and garlic. Cook about 3 minutes until soft but not browned. Get creative. Use whichever vegetables and meats you like. What do you have in your refrigerator? Just throw it in. 2 cups of leftover meat, ground beef, pork tenderloin, turkey meat, etc. Add all the remaining ingredients to the pot of softened onion and garlic and bring to a boil. Reduce heat to low, cover, and simmer until the lentils are tender - about 30 minutes. You may want to add the tomatoes at the end of the cooking time if you’d like them to hold their texture. Preheat oven to 400 degrees. Oil and flour a pie plate or 8 inch baking pan. Combine the 1 cup water with vitamin C crystals and stir. Set aside to dissolve. Combine flour, baking soda, and salt in a bowl. Whisk well to distribute the soda. Add liquid with dissolved crystals and oil at the same time. Stir quickly with a few swift strokes, only until the dry ingredients become moist. The batter should be heavy but pourable. If necessary, add another 1 or 2 tablespoons of liquid. Scrape batter into the pan and bake 16 or 20 minutes or until a toothpick thrust in the center comes out clean and dry. By William G. Crook M.D. ; Marjorie Hurt Jones, R.N. 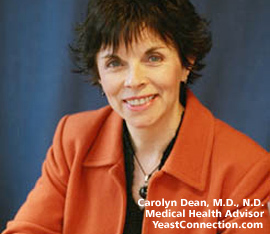 The first 100 pages of this book were written by Dr. Crook and include a discussion of yeast - related problems, diets and the important role proper diets play in helping people control yeast. The second part of the book is written by Marjorie Hurt Jones, R.N., an experienced cook and an authority who has written a number of other books which deal with diet, including a popular book, The Allergy Self-Help Cookbook published by Rodale Press on food allergies, and Baking with Amaranth. Purchase now.